Through their five-game win streak, including their most recent convincing 48-28 win over USC, the Ducks have looked very much like the Ducks of the last few years — Duck teams that relied on almost unstoppable offenses and opportunistic defenses to dominate the Pac-12. Unfortunately for the Ducks, they they did not look like this through the first six games. As we fans are too painfully aware, Oregon started 3-3 as an inept offense and Swiss cheese defense made many of us question if the Chip Kelly and Marcus Mariota magic had left Eugene and with it any hope of remaining an elite college football program. Many questioned if Oregon would permanently return to being a solid but no longer a consistent top five program. However, looking a little beyond the 62 points given up to Utah and the 500+ passing yards given up to Washington State in defeats, you can see how close Oregon still is to fighting for a college football playoff spot and this season not looking too dissimilar from last season. The two biggest drivers of the fall-off in performance have been an injury-plagued young secondary and Vernon Adams’ finger injury. 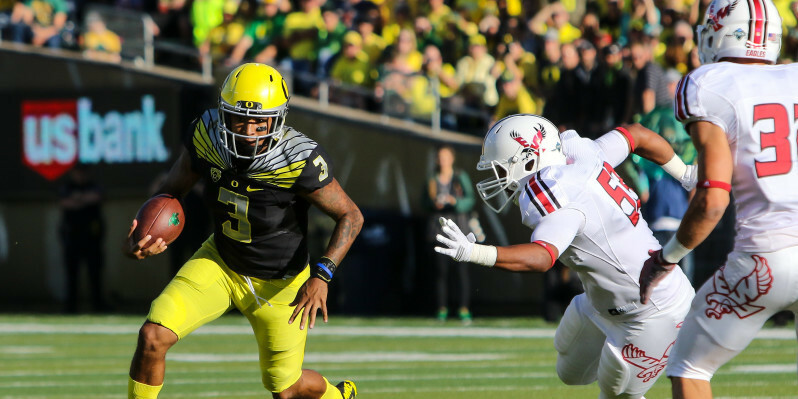 But what if Vernon Adams does not break his finger in the first game, where would the Ducks be right now? Any team can play the what-if game in college football, and every team’s season would look a lot better if a couple of injuries could have been avoided or a couple of balls had bounced a little differently. The bottom line is that Oregon has lost three games. Michigan State, Utah, and Washington State all deserved the wins they got over Oregon. The what-if game is helpful, though, to gain some more perspective. Last year, Mariota stayed healthy more or less while the offensive line took some lumps. In the end, however, Mariota was able to work his magic and get the Ducks all the way to the national title game. This year, an injured Adams was off his game a bit against Michigan State. A healthy Adams (i.e., zero broken fingers Adams) probably does not overthrow a wide-open Byron Marshall in the end zone with 1:30 left in the 4th quarter. If he makes that easy throw, the Ducks are up four with a minute left and likely win that game. Additionally, Adams sat out the Washington State game. And while it is hard not to love the loyalty and hard work both Jeff Lockie and Taylor Alie have shown in the Ducks’ program, they just are not Vernon Adams. 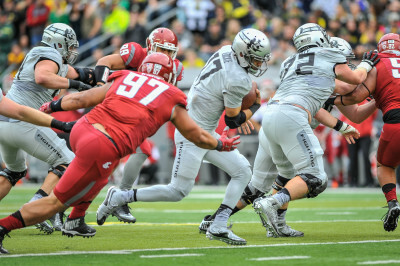 Lockie and Alie’s quarterbacking abilities and a combined 123 yards passing against WSU just were not enough. A healthy Adams is worth at least one incremental touchdown to Oregon, and the Ducks probably would not have lost at home to Washington State in overtime if Adams had been healthy. The Utah game was going to be loss regardless of Adams’ health. Even if Oregon had Mariota again, let alone Adams, it is hard to see how Oregon could have won that game. That was Utah’s night. Everything clicked perfectly for them. However, the Utah game was not too dissimilar from the blowout loss to Arizona the year before when Oregon recovered and made it to the national title game. If a healthy Adams could have proved the difference in the Michigan State and Washington State games, the Ducks would potentially be sitting at 10-1 right now and in the same position as last year at this time. Last year, Oregon started off a little slow due to some inexperience and injuries along the offensive line, leading to some very close calls (WSU last year) and a big loss to Arizona. By the end of the year though, the young offensive linemen had improved and some of the injured players had returned, allowing Oregon to finish the year very strong. Similarly, if you were to take away the Adams’ injury this year, inexperience and injuries in the secondary would nonetheless have led to a slow start and a bad loss to Utah. However, as the year has gone on, the secondary has gained experience and begun to get healthy again, and the Ducks are one of the hottest teams in the country heading into week 13 of the season. 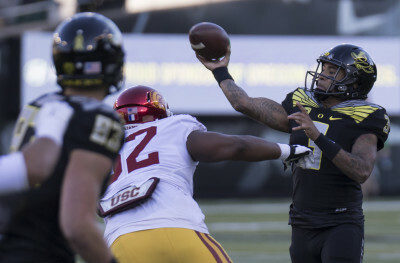 Vernon Adams turned in a historic 400+ yard 6 TD performance against USC. Even with some shortcomings, the Ducks are likely a healthy finger away from being 10-1. That difference between 8-3 (and being irrelevant in the playoff conversation) and being 10-1 (and very much in the playoff conversation) is a very thin line. However, if you play this what-if game the other way, the line between 8-3 and 4-7 is also thin. What if Adams had decided to not come to Oregon last year? What if Adams had missed a couple more questions on his infamous math test? Based on how Oregon looked without him behind center, you can almost guarantee the Ducks would have lost to Arizona State, Stanford, and probably Washington and USC, too. College football is ultra-competitive and the difference between being an elite team in playoff contention and a good team hanging around the top 25 is small. The Ducks could get back into national prominence as early as next year and remain there for quite some time. But the margin for error is extremely small indeed, and the Ducks need to figure out something with their QB situation moving forward and see continued growth in their secondary for that to be a possibility.